The brief version of this post is: I'm loving Topshop's t-shirts right now. Sadly, I'm currently on a self-imposed spending ban, as I've been paying for, or am soon to be paying for, a holiday, car tax and insurance and a hen do over the next month or so, therefore unfortunately personal spending is low on the priority list. However, even when we can't currently purchase, we can always covet. 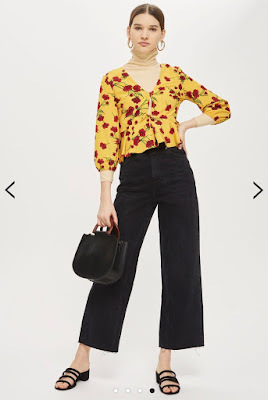 I have been loving Topshop's Spring collection and cannot wait to finally get a little spendy (it'll probably be a pretty major birthday treat-yourself shop), so I thought I'd share with you the pieces I've got my beady eye on right now. A great way to sum up my favourite trends so far this season. 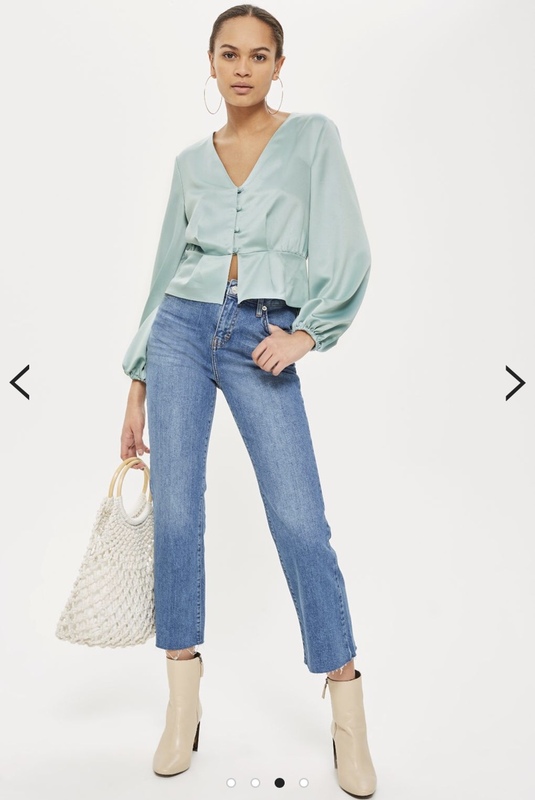 I am LOVING the silky blouse look for this Spring, so this one is an obvious winner. The gorgeous pale blue colour is a perfect match for this material, as a whole these compliment each other to give the most elegant, yet understated look. It's a very simple long sleeve design, but it would definitely have a big impact on any outfit. Next up are these three motif Ts. 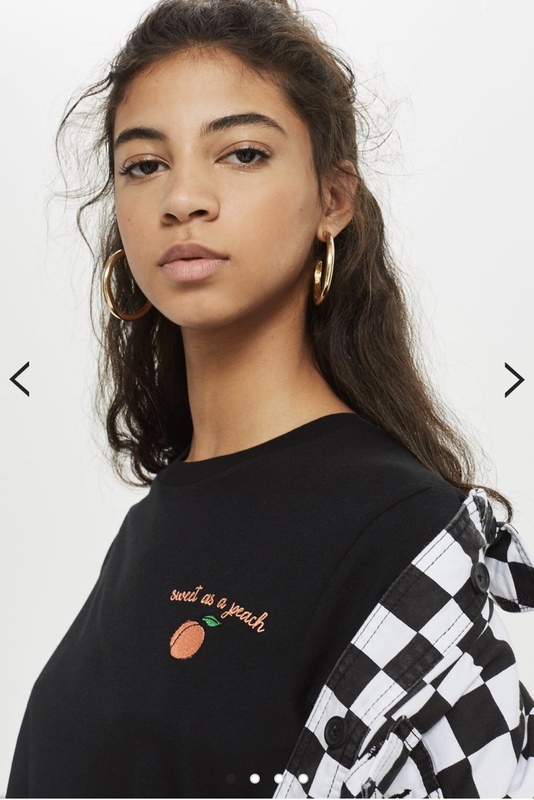 I generally go for plain basic t-shirts, but the little motifs on these are so small and simple, I love them. A trend I can certainly get into. 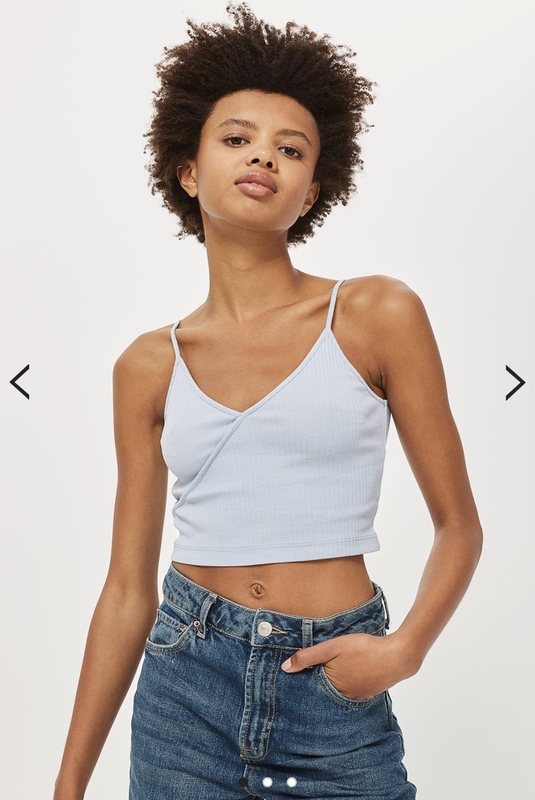 I just think there's something slightly witty but also idgaf about these tops, and I just love them. 10/10. 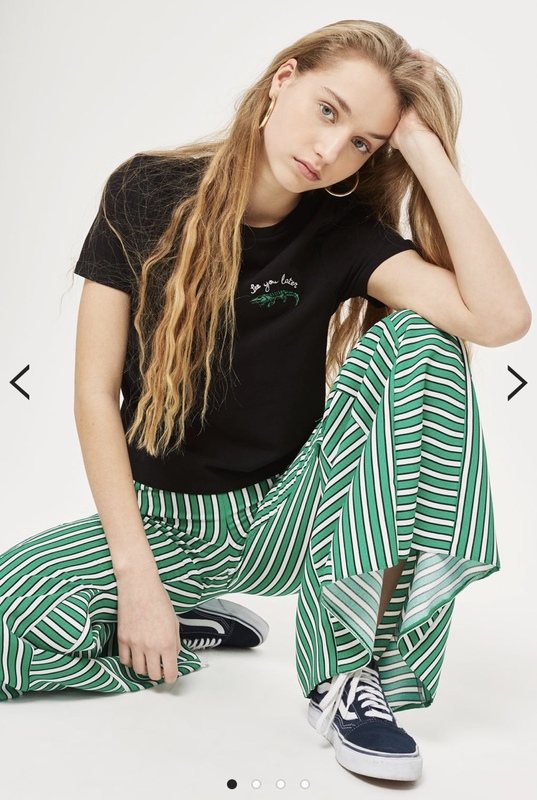 This simple stripe t-shirt is something I'm surprised I don't already own to be honest. Yellow is my favourite colour but I often feel it's a bit too 'out there' to wear day to day, so I think stripes are a great way to make a bold colour a little less in your face. 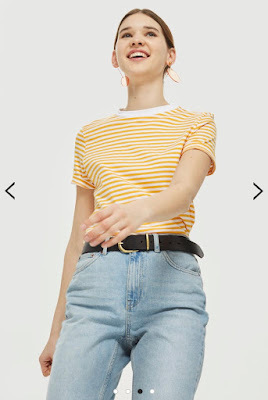 The perfect striped T.
I haven't worn a halter neck top since I was probably about seven, so this could be revolutionary or it could make me feel like a child again. I know they've been very 'in' recently, so I wanted to give them a go again, and I think this one is such a nice way to wear the trend. I love somewhat delicate florals and this one is so pretty. Also thinking that the shirred material will make it easier to wear without a bra? We'll see. Lastly on the top front, is this wrap crop top. Perfect for the summer, it's a basic we could probably all do with. I love the pale blue shade of this one in particular, if I ever manage to tan this would look super nice, but luckily it's also a shade that will look okay on my pale skin. The two dresses I'm loving right now are quite different in style, but both have an elegance and slightly sun-faded look to them. The first is a very simple but stylish shirt dress, in the most gorgeous pastel pink corduroy. 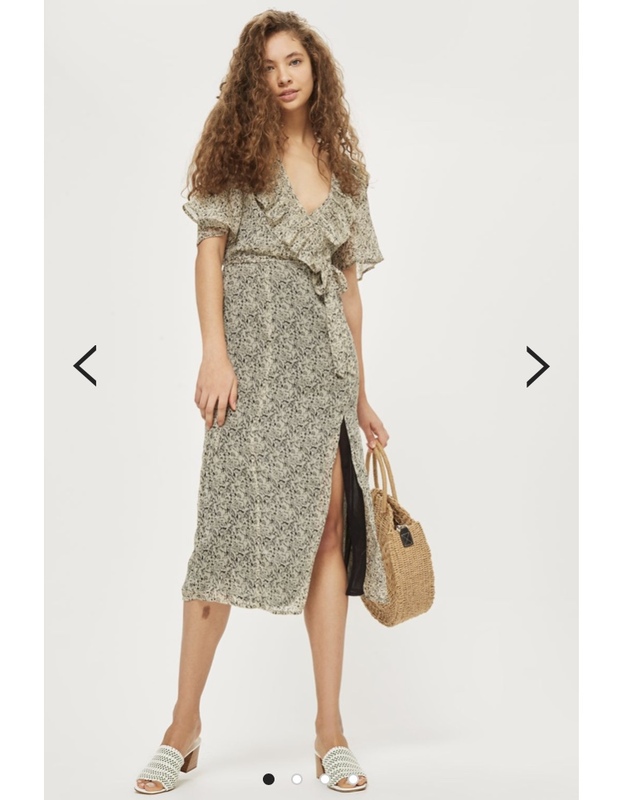 This is the ideal loose S/S dress in my books, and it looks like it might be the right kind of length for me too, which is a massive bonus. 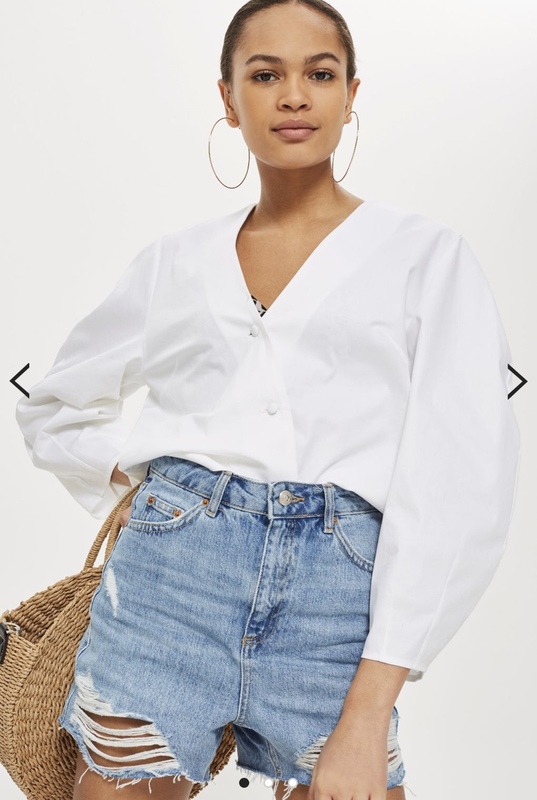 I can picture myself sauntering around wearing this is a warmer climate, looking chic af *fingers crossed*. The other one is this *gorgeous* floral midi dress. I think midi dresses tend to be a really flattering length, and can be a great, safe option when you're on the taller side. The style of it is so classic and elegant, I really like the effect of the frills and overlaid fabrics. 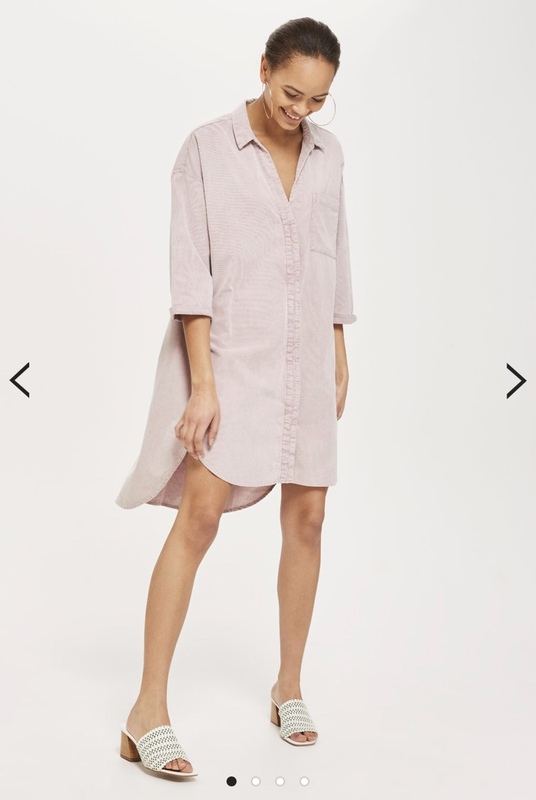 I envision this dress on a late afternoon in Positano, which I know is so specific and not somewhere I'm going to find myself any time soon, but the colour of the dress with the late afternoon sun would be so dreamy. Big dreams. I think I've talked about most of the jumpers already through the colder months and therefore there's just one I'll be mentioning today. Cream is my all time favourite colour for jumpers, so this one, with a bit of black sleeve/collar detailing, is, of course, a winner. I love the way this one hangs on the body too - basically my perfect jumper. As ever, I'm on the hunt for jeans that fit me nicely. They're incredibly hard to come by, but I'm willing to try pretty much any pair. 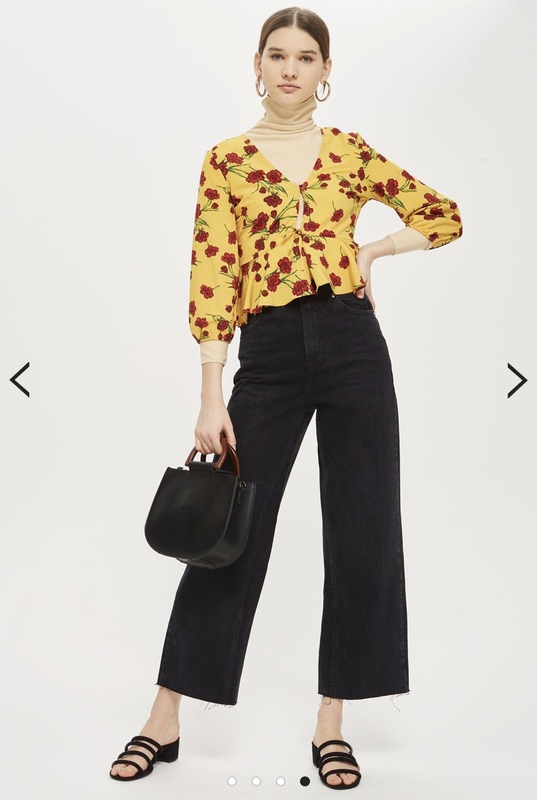 I really love how these Cropped Wide-Leg Jeans look on the model and am hopeful that they would look nice on me. I think this is my favourite jeans trend I've seen in a while, and a great way of wearing jeans in the summertime, when you want everything to be a little looser and more comfortable. My fingers are crossed that these will work for me. 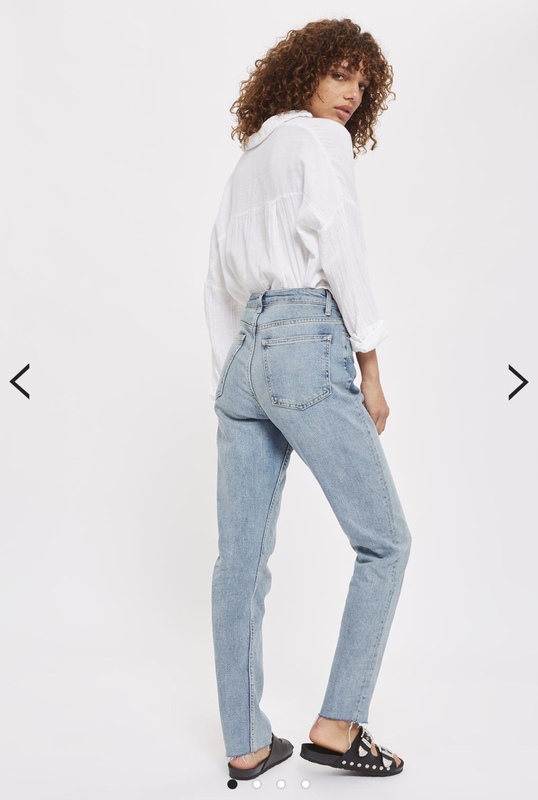 I think I'm going to try Mom jeans again. The first time I think I didn't get a Tall pair and was ultimately put off (for some years). This slightly faded black pair look really nice on the model and I like how as a style of jeans they're looser on the legs but a bit tighter at the waist, as that's what I'm in need of. They just look really flattering. Then there's this bleached pair of straight leg jeans, which I envision looking amazing in the summer. 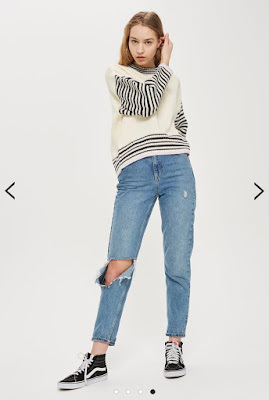 Straight leg jeans aren't something I've tried yet, but as I said, I'm open to trying anything. I like the raw hem on these - it makes them seem even more causal than jeans generally do. And again, they're more cinched in at the waist, but looser on the legs. The ideal. Could this be the year I finally wear denim shorts? It may just be, because I love these. I don't generally go for ripped anything - it's just never been my kind of thing. But these look amazing?! They are Tall, of course, because I don't think I could ever wear a part of shorts that weren't, and they look really flattering - high-waisted and a great shade of blue. 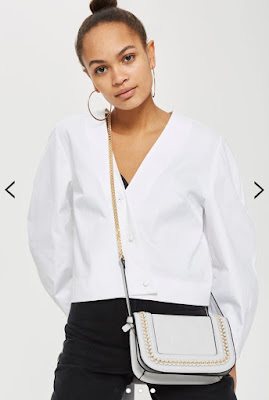 I don't really update my accessories very often, but I've seen not one, but two bags on Topshop that I'm loving right now. 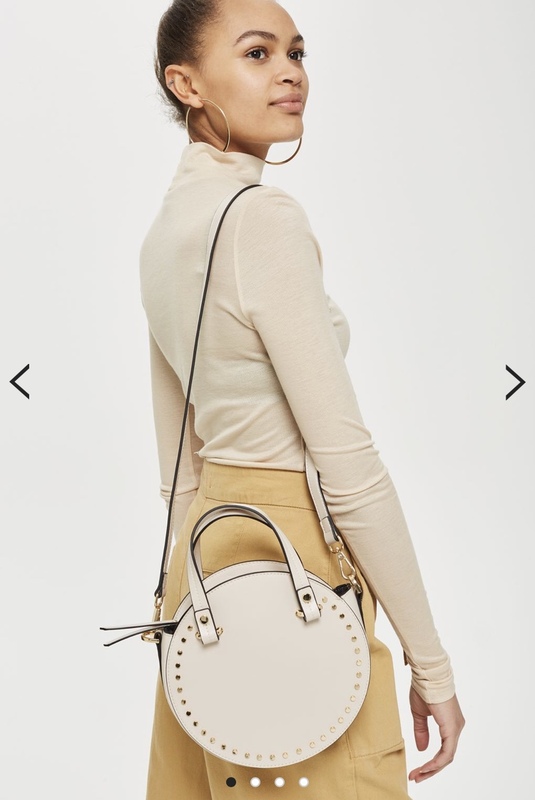 The first is this light grey cross-body bag, with gold chain detailing. Grey is one of the most ideal colours for a bag, as it's all-seasons appropriate and additionally would work with any outfit. I think the warm gold really compliments the lightness of the grey too, which is lovely. Just a cute little bag. 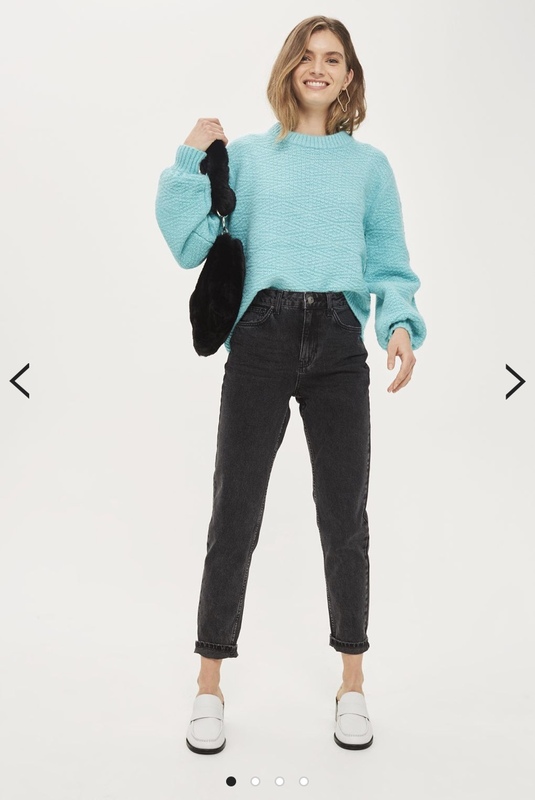 The other one - that I'm pretty much definitely going to buy - is this circle bag. This is the kind of bag that a year ago I'd have looked at and not really understood *why*, but now I think different shapes can really add something to an overall outfit and give it extra dimension. It looks so chic and is, again, a neutral colour that would work with any outfit. I get all the S/S vibes from this and I love the gold detailing (gold is my metal of choice). So there we have it. 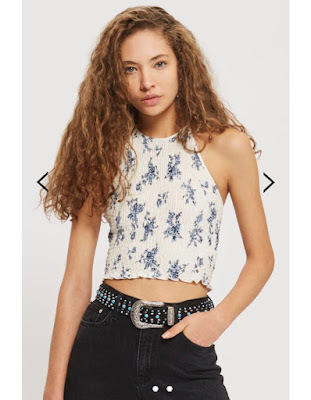 My current Topshop pics for the Spring time. I will, without a doubt, be making an order in the not too distant future, and I'm sure a lot of these will be in my shopping basket. What are your favourite Topshop pieces right now?